European scientists have created an Escherichia coli strain with a separate genome using chlorinated DNA. The genome should be unable to transfer back into unmodified bacteria, leading to what the researchers call a 'genetic firewall'. The base pairs used in DNA are so universal (A, T, G and C) that genes can hop between species all the time, especially between bacteria. Horizontal gene transfer, as it is known, is how antibiotic resistance is spread and some people are concerned that it could lead to genetically engineered DNA crossing to wild-type species. Because this new bacterial genome uses a different set of DNA bases, if any horizontal transfer did occur, the bacteria that got the new DNA would quickly die, containing the spread, says Rupert Mutzel from the Free University of Berlin, Germany, who led the research team. 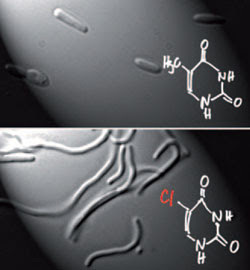 Mutzel and his team used 'good old Darwin' to speed up the evolution of E. coli until it used chlorouracil - a chlorinated analogue of the DNA base thymine (T). To replace the requirement for thymine with this new base, the team used a new device that cycled normal E. coli between alternating growth media. One growth medium contained T and one held chlorouracil. Slowly - through multiple cycles - bacteria are selected that incorporate chlorouracil and can survive without T.
The team observed that the evolving cells were initially irregular filaments, but progressively they recovered the appearance of short rods typical of wild-type E. coli. But at the moment, the bacteria aren't completely isolated from our DNA world of A, T G and C. If the strain is given thymine it will use that instead, before happily going back to using chlorouracil when put into growth media containing that. Creating a completely separate but parallel set of life is the next step so that the genetic firewall is truly secure and the bacteria can't return to using thymine says Mutzel. Then his new, secure, chemically altered world can be used as biological factories for fuel and feedstock chemicals without worry. If the bacteria did get out, claims Mutzel, it would then just die because it couldn't find any chlorouracil.